McLaren Automotive celebrated the launch of its latest hypercar recently by taking the owner of the very first production model on a 1400km road trip. The McLaren Senna is the latest product in the manufacturer’s top of the line ‘Ultimate Series’ range, following in the tyre tracks of the incredible P1. Named after McLaren’s most successful Formula 1 driver, Ayrton Senna, the new car is designed to be the ultimate track machine. It features a 789bhp twin-turbo V8 engine that powers the lightweight 1200kg chassis to 60 mph in just 2.7 seconds and on to a top speed of 211mph. The dream machine also includes state-of-the-art aerodynamics and a seven-speed dual clutch gearbox. The very first production car off the line, carrying chassis number 001 was presented to London-based businessman David Kyte by McLaren Automotive CEO, Mike Flewitt. Rather than heading home via a trip to Halfords for a new set of polishing cloths, Kyte was accompanied by five McLaren cars – including a further three Sennas – on a trip to the south of France. The supercar convoy also included a McLaren 720S and a McLaren 600LT, and the drivers included McLaren Automotive Chief Operating Officer, Dr Jens Ludmann, McLaren Ultimate Series Vehicle Line Director, Andy Palmer, and racing driver Bruno Senna, nephew of the Brazilian F1 legend. The group’s destination was the Paul Ricard circuit near Marseille, ironically a track where Ayrton’s great rival Alain Prost dominated Grands Prix in the late 1980s. Kyte, a McLaren enthusiast and collector, then took part in a Pure McLaren driving experience at the circuit, as well as competing in the FIA-sanctioned Pure McLaren GT Series in his McLaren 570S GT4. Having chosen the very first production chassis, Kyte took great care in ensuring his Senna will be one of the most coveted of this very exclusive product. 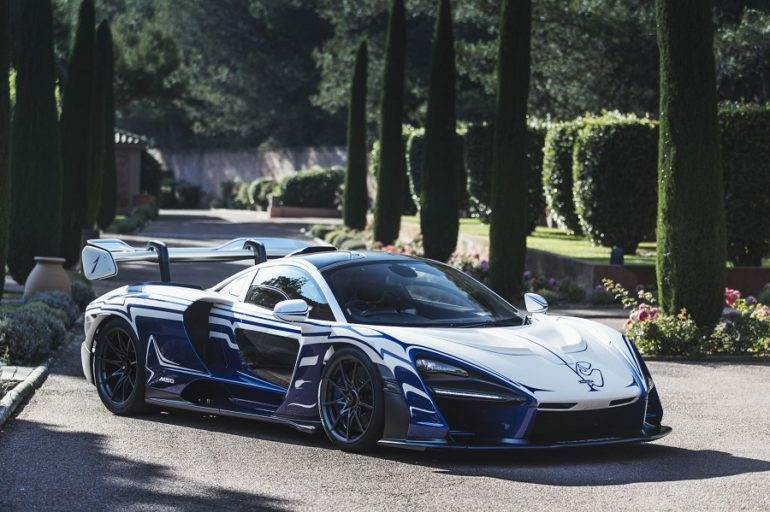 It features a bespoke design commissioned from McLaren Special Operations, and is painted Anniversary White with a striking livery painted in Aurora Blue. The roof ‘snorkel’, T-Bar and fuel filler cover are all finished in Satin Visual Carbon Fibre, whilst the brake calipers and centre lock wheel nuts are also brightly finished. The paintwork took more than 600 hours to complete, with two paint specialists devoting two weeks to prepare the car before the special livery was applied. Kyte’s car also features several references to the legendary Ayrton Senna: the Senna brand logo is proudly displayed on the wing endplate, whilst the Brazilian champion’s signature is on the door shut. The throttle pedal is engraved with each of the three years Senna was crowned World Champion, and the layout of the Interlagos circuit in São Paulo, Brazil – which features a section known as the ‘Senna S’ – is clearly visible on the front of the car. The interior, which has also been specially customised, also features the Senna logo embroidered on each seat headrest. Lucky owner Kyte said: “I committed to buying a McLaren Senna as soon as I became aware that McLaren was developing the car – so long before the name was confirmed – but leaving the McLaren Technology Centre after the handover ceremony was the first time I have actually driven one. Now, with 1,400km covered, I’m delighted to report that as someone who rates driver engagement as crucial to driver enjoyment, the Senna has more than exceeded my expectations. “Working with McLaren Special Operations on the bespoke design of the car was a fascinating experience; MSO has undertaken personalisation on other McLarens I own, but this was a much more complex project. The original inspiration for the livery was to trace the way that the air flows over the body but we decided on a more stylised design, with which I am absolutely delighted. I also love the fact that there are features on the car that are almost hidden, such as the details honouring Ayrton Senna and the McLaren ‘Speedy Kiwi’ on each side of what I am extremely proud to call, ‘my Senna’”.